A little while back I was reminded of the ABCD matrix during a discussion on the synth-diy mailing list. While they have been around for decades their power and simplicity is perfect for design and analysis of passive filter networks. On this page I bring together the theory of the ABCD matrix, and show how it can be used to solve seemingly-complex passive networks using nothing more than 2x2 matrices. And along the way we'll use computers to do the tedious algebraic crunching. The ABCD Matrix (or Chain Matrix or Transmission Matrix) describes a two-port network: a box with a two-wire port on the left and a two-wire port on the right. One peculiarity of the ABCD matrix as compared to the other two-port networks is the direction of the current flow on the second port is reversed (those familiar with two-port networks would have spotted the "wrong" sign of I2 already). The importance of this subtle distinction comes to light when we cascade - or chain - two networks whereupon the output current of the first network becomes the input current of the second network without tedious sign-changing to worry about. Components A and D are dimensionless ratios, B is in Ohms, and C is in Siemens. A network is said to be symmetrical (input impedance equals output impedance) if A = D. A network is reciprocal if AD - BC = 1; that is, the voltage at port 2 when a current is applied to port 1 is the same as the voltage at port 1 when the same current is applied to port 2. Note that the order of multiplication is important in matrix math so make sure you follow the order as described by the circuit. There are just two basic networks to consider - what we might call the canonical forms. These are the series element and the shunt element. The series element has one impedance - Z - in series with two of the port connections. The convention is as shown below although there is no reason it cannot be in the bottom connection. To illustrate how ABCD matrices are applied we show how the transfer function of the well-known RC low-pass filter can be derived from a chain of a series resistor and a shunt capacitor. which is the well-known transfer function of an RC low-pass filter. ABCD matrices work fine for chaining two or more networks in series, but are rather difficult for parallel networks (e.g., twin-T notch filter). The solution is to use Y (admittance) networks as an intermediate step, converting the two ABCD matrices into Y matrices, adding them, and then converting the resulting Y matrix back into an ABCD matrix. I don't know how many times I have started out to actually solve the unbuffered case (A). I always gave up, even after dropping back to the case where all the R's and all the C's were equal. It clearly was not impossible - just excessively tedious. 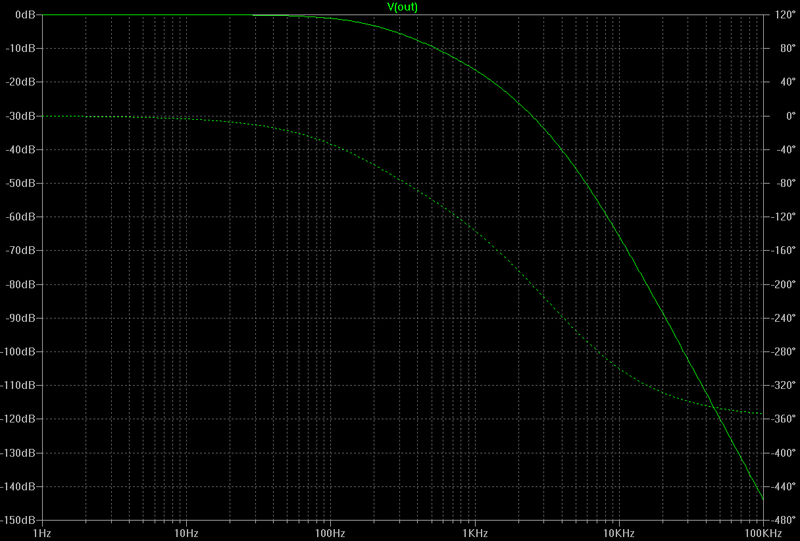 The first term is the familiar RC low-pass filter we derived above. The second term is rather more complex. If we rewrite the term substituting \(p = sCR\) then we have a simple cubic expression \(p^3 + 6p^2 + 9p + 1\). Using any one of the online cubic solvers we find the three values for \(p = -0.121, -2.347, -3.532\). Notice that they are all real, i.e., lie on the real axis. 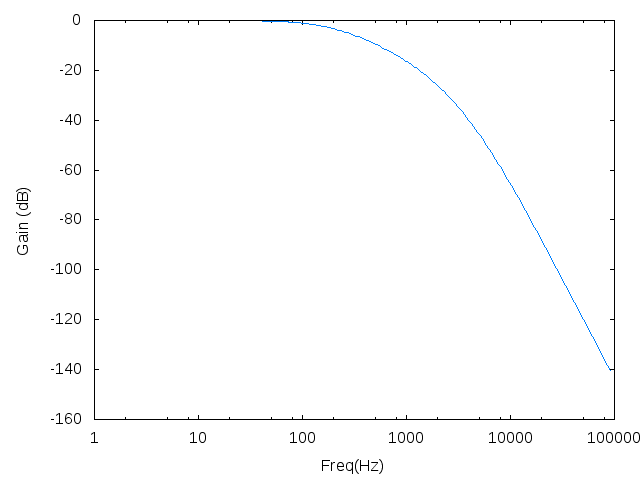 For the plot below we set R to 1k0, C to 100n and sweep over the range 1Hz to 100kHz. Some interesting observations can be made from the spice plot. Firstly, note that at around 2kHz the phase (dashed line) reaches 180° of phase shift. In other words a 2kHz sine wave is inverted, albeit reduced in amplitude by about 26dB (roughly 1/20th of the input level). Secondly, the phase shift continues heading towards 360° - by the time the frequency reaches around 1MHz the phase shift is very close to 360°, although this far from the cutoff point the attenuation is around 200dB. Things get rather theoretical down at this level! A little while after publishing the above analysis Hutchins wrote a response published as ENWN42. While taking a slightly different route to the common-RC solution he arrives at the same point, and extends the work by plotting the root-locus of the filter in the presence of feedback. The classic twin-T filter is a purely RC circuit that can produce a very sharp notch response. It (or its close cousin the bridged-T) is often used in audio analysers to remove the fundamental signal. The circuit is remarkably simple, yet theoretically can achieve very deep notches. As can be seen the circuit comprises two T-sections (one RCR the other CRC) wired in parallel. On one branch the current leads, and on the other the current lags. As the frequency approaches the notch frequency the phase shifts approach ±90° effectively cancelling each other out at the summing node. If all the components were ideal then the cancellation would be perfect. Still quite a handful, so we apply the usual simplification setting \(R1 = R, R2 = R, R3 = R/2\) and \(C1 = 2C, C2 = C, C3 = C\). In this section we have seen how the ABCD matrices can be used together with automated tools (maxima in this case) to analyse the behaviour of passive component networks. While intermediate results may look scary, in practice we are primarily interested in the transfer function which is readily extracted from the ABCD matrix. As an aside, there may be readers thinking "Ah yes, but what if there is an inverting op-amp on the output, so we can't assume that \(I_2\) is zero. What then smarty-pants?". In that specific case you can model the input resistance of the inverting amplifier stage as a final shunt resistor and then you can either consider the output voltage, as before, or determine the current through the resistor as the current into the transimpedance (current-in-voltage-out) amplifier.